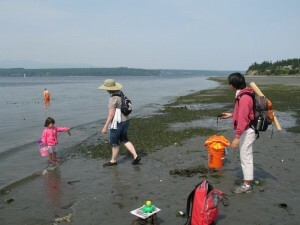 Great weather, great low tides and great events! The new moon in June is upon us. 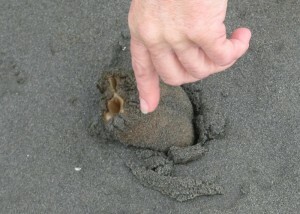 Accompanying it are likely the lowest daytime tides of the year. Better yet, the forecast suggests we’re in the 70’s and sunny to partly sunny this weekend. What a great time to get out to the beaches! 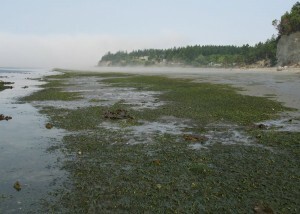 When the tide is this low on summer days, the plants and animals are stressed by the sun, wind, and heat, so please remember to tread lightly. Watch your feet and walk instead of running, wet your fingers before touching plants and animals, don’t turn over any rocks bigger than your head, and walk around the edges of the eelgrass or kelp beds. 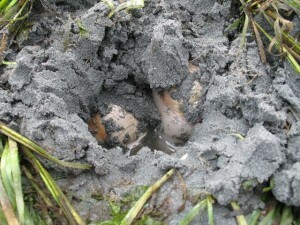 If you’re digging clams, don’t forget to fill your holes back in (don’t want to smother the next crop!). – From 10am-1pm, join me and the Kitsap Beach Naturalist volunteers as we enjoy and explore the Foulweather Bluff Nature Preserve (Hansville). – Beach Walk and shellfish harvest/cooking demonstrations at Twanoh State Park (Union) – led by the Puget Sound Mycological Society. – Water celebration (9am-2pm) and low-tide beach walk (late morning) at the Kingston Farmers Market – coordinated by the Stillwaters Environmental Education Center (scroll half way down the page). Jeff Adams is a Washington Sea Grant Marine Water Quality Specialist, affiliated with the University of Washington’s College of the Ocean and Fishery Sciences, and based in Bremerton. You can follow his Sea-life blog, email to jaws@uw.edu or call at 360-337-4619.